Richard Nixon tried to deport John Lennon because he considered him a 'dangerous political ... . Beatles Radio: The Beatles, Solos, Covers, Birthdays, News The Fab 4 and More! Richard Nixon tried to get John Lennon thrown out of America because he saw him as a ‘counter-culture enemy’, according to a new documentary. The former US President was so paranoid the Beatles singer could inspire the youth vote against him that he wanted him deported. Lennon biographer Tim Riley said that Nixon regarded the Liverpudlian as ‘dangerous political leader’ and wanted him gone before the 1972 US election. 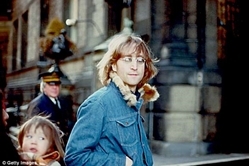 According to ‘John Lennon: It Happened Here’, which is screening on US TV network Reelz, Lennon’s anti-war views and support of free speech made him a target for Nixon.At the time Lennon was living in New York where he recorded ‘Imagine’ in 1971 after the break-up of the Beatles. He also staged his ‘Bed-In for Peace’ with his wife Yoko Ono where they stayed in bed for a week to call for peace. All of this turned Lennon into an icon on the left at a time of protests over the Vietnam War and rising suspicion of the US government. Riley said that the Nixon White House took the threat posed by Lennon so seriously that they ‘decided to attack his immigration status’.